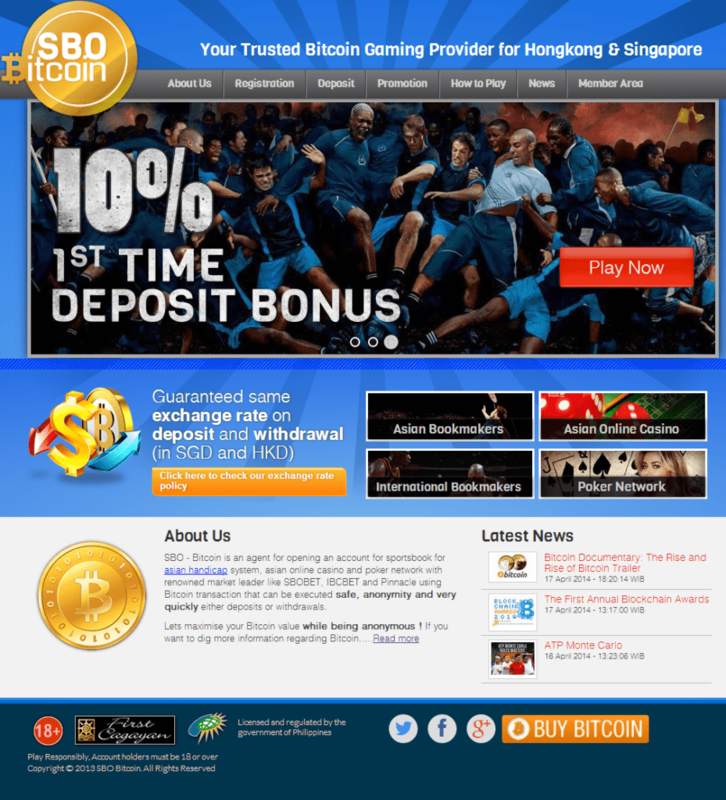 The SBOBitcoin brand was been established in 2013, when the online Bitcoin gaming market was already well under way. The company was founded by the Ole Group International in the Philippines and it has a strong presence on the Asian gaming markets, predominantly Hong Kong and Singapore. SBOBitcoin is more than the average Bitcoin gaming establishment – their offer includes a wide range of international and Asian sports betting options, a fully functional online casino and an interactive poker network. The main feature of SBOBitcoin, apart from the extensive offer of games and betting options is the fixed exchange rate for Bitcoins for deposits and withdrawals, i.e. even if the value of Bitcoins fluctuates bellow the accepted value, the site will award the players with the original (deposited) value of the Bitcoins. SBOBitcoin will impress any new player seeking to try out the new and exciting Bitcoin market thanks to their excellently designed and thoroughly inviting website. The combination of animated menus and clearly categorized features are sure to charm even the most jaded gaming enthusiasts out there. The real treat is under “the hood” though, with a easy and straightforward sign up process and a ton of well organized and presented gaming possibilities. New players who do not have prior knowledge of how to use Bitcoins can find detailed instructions and guides to help them get started. A minor annoyance is the different log in for each service, meaning you will have to create a separate account for accessing the bitcoin sportsbook, the casino and the poker rooms. As for the games themselves, the in-house software is competent enough to offer decent graphics, with several unique takes on well known titles, from either casino or the poker games category. Optimization is also excellent, with instant transitions and no performance hick-ups even on older machines. One of the excellent features that are part of SBOBitcoin is the initial bonus for new players. Every new account holder who has recently made a deposit at SBOBitcoin can claim a 10% bonus on their first deposit amount. The maximum value that can be claimed is set at HKD 5000 and has a 4x rollover requirement in the sportsbook. 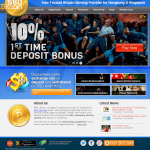 The prime reason for visiting SBOBitcoin is their excellent offer and support of both international and Asian-based bookmakers. The sports selection is vast and covers all sports including soccer, basketball, volleyball, tennis, football, etc. Asian bettors have the option to place bets on local teams and cups as well, making the betting much more attractive and fun to track. Poker players will find SBOBitcoin’s Poker network teeming with players from various skill sets, participating in daily and weekly tournaments that hold thousands of Bitcoins in prizes. There are many games to choose from, adopted from the international and Asian market respectively. Lastly, the online casino portion is furnished with a host of entertaining and rewarding casino titles, including slots, video poker and table games, with themes that are more akin to Asian than Western culture. SBOBitcoin supports direct email via their official website, with representatives answering questions and responding to requests on the official BitcoinTalk forums as well. The brand is also very active on social networks with profiles on Facebook, Twitter and Google+ and you can PM or tweet their customer support team if you so prefer. Having a separate account in order to access each portion of SBOBitcoin can be a little tiresome but it helps reduce the threat of having your account compromised by a long shot. Bettors and players alike can rest assured of their anonymity when visiting SBOBitcoin since the log in process doesn’t require any personal information, apart from username, password and a valid Bitcoin address. The transaction process is made safe thanks to latest SSL encryption technology, as well as cold wallet storage for the Bitcoin funds. Placing a deposit for either betting or playing at SBOBitcoin is possible via a valid Bitcoin address and can also be achieved by purchasing credits from a licensed Bitcoin dealer. Either way, the process is simple and once registered, you will be able to fund your account in minutes. Withdrawals take a little longer to process since SBOBitcoin keeps a very high security standards, which in turn require manual processing and at least two verifications before the Bitcoins will be sent to your predetermined address. SBOBitcoin is aiming at the top with their extensive offer of both Asian and International offer of betting options, casino and poker rooms. Their 10% initial bonus is a nice incentive that should convince many new players to give it a go, and the security and prompt online Bitcoin transactions are just icing on the cake.